NORD DRIVESYSTEMS supplies efficient drive units for dynamic speed control and automatic process control in applications that need to be regularly cleaned with high-pressure steam jets. Developed for strict hygiene requirements and featuring IP66/IP69K ingress protection, smooth-surface motors with an integrated frequency inverter are available for the 0.37..1.1 kW performance range. Common applications include conveyors, pumps, mixers, and agitators. Sensor data such as pressure or flow rate values can be directly communicated to the drives, enabling them to automatically adapt to current demand. If partial load operation is frequent, an automatic energy-saving function decreases the running costs by a significant share. In conveyor applications, light barriers can be used for contact-free or gapless accumulation. A soft start function reduces the starting current and results in less stress on the mechanical system and the transported goods. The drives tolerate high temperature fluctuations and are suitable for ambient temperatures from -25 to +50 °C. The type SK 180E inverter comes in a rugged die-cast aluminum housing that absorbs impacts up to 7 J. The cooling fins are especially flat and easy to clean. Due to class C1 radio interference suppression and a discharge current decidedly below market average, SK 180E drives can even be operated on standard domestic power sockets. NORD also manufactures a range of gearboxes with specially smooth surfaces and high power density. Full compatibility of all components enables fine-tuning of output speed and torque according to actual plant requirements. 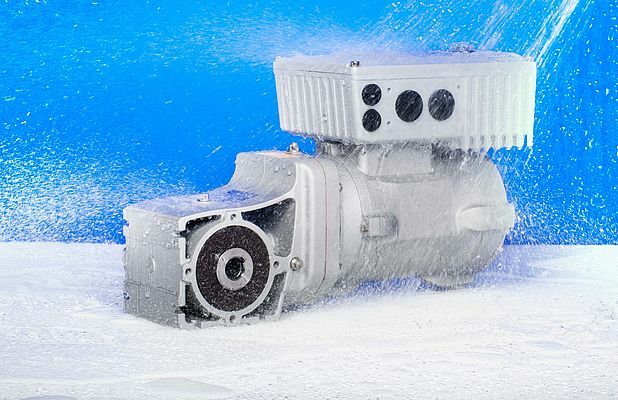 The optional nsd tupH surface conversion treatment endows the aluminum smooth-surface motors and gearboxes with corrosion resistance similar to stainless steel drives without the scratch or chipping risks of a paint finish. At the same time, the drives are much lighter and have a better thermal performance than stainless steel units. The NORD-developed treatment is compliant with FDA Title 21 CFR 175.300 requirements. With these integrated drives, commissioning and operation is very user-friendly, including applications with a large number of drives and spacious facilities. The company delivers complete systems parameterized for the customer's needs and including the required communication interfaces.